There's a wide array of anti aging beauty products in the market today. From creams to pills to high tech anti aging devices, it's not surprising that many people are lured into using these products. While these anti aging products can help you erase signs of skin aging on your face, a few changes in your diet can also help you reverse that aging clock. Yes, you can reduce your wrinkles and fine lines simply by eating food! 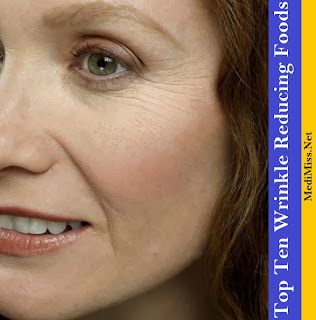 Let me share to you some of the best wrinkle reducing foods and make it a habit to incorporate them into your daily diet. 1. Spinach. Popeye's favorite vegetable can reduce your wrinkles in a major way. Spinach is rich in lutein which has been known to help hydrate the skin and improve its elasticity. 2. Olives. Fresh olives and virgin olive oil are rich in oleic acid which can help in improving the texture and the color of one's complexion. So skip the butter and dip your bread in EVOO instead. 3. Beans. Beans may be high in uric acid but it is also high in hyaluronic acid. This substance helps keep our skin look plump and smooth which in turn makes us look younger. 4. Tomatoes. Tomatoes are loaded with antioxidants as well as lycopene which reduces the risk of developing cancer. Experts say that lycopene is 100 times more powerful than vitamin E so that means it's more effective in keeping the skin healthy and youthful looking. 5. Flaxseed. Flaxseed is a popular natural wrinkle fighter. It's even found on many anti aging products in the market today. This wonder food is rich in proteins such as omega 6 and omega 3 which are great in making the skin look and feel smooth. 6. Berries. Berries are super rich in antioxidants as well as skin friendly vitamins C and E. Here's a tip, always choose the darker berries such as blueberries and blackberries because they are packed with more anti aging nutrients as compared to their lighter counterparts. 7. Salmon. Just like flaxseed, salmon is a good source of healthy protein such as omega fatty acids. Regular intake can help improve the texture of your skin. 8. Green tea. This wonder tea is rich in phytochemicals and polyphenols which can help slow down and reduce the development of wrinkles. 9. Chocolate. Yes, you've read it right. Chocolates, specifically dark chocolates are rich in antioxidants which can help detox and rejuvenate the skin. It also contains polyphenol which has been known to slow down the development of wrinkles. 10. Prunes. Prunes are loaded with antioxidants and fiber which promotes a healthy digestive system. Regular intake helps keep your skin healthy and radiant.